Nantes' Argentinian forward Emiliano Sala gestures during the French L1 football match Nantes vs Montpellier at the La Beaujoire stadium in Nantes, western France, on January 8, 2019. The 28-year-old was recently added to the roster of Welsh team Cardiff City in the Premier League and was flying over the English Channel in a single-engine aircraft when it dropped off radar. 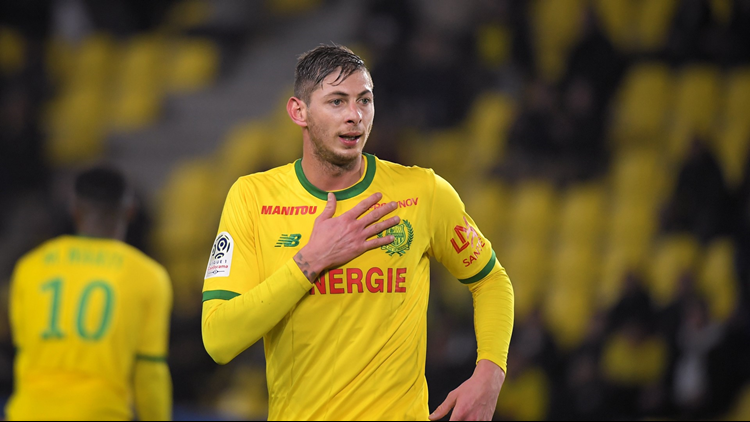 A body recovered from the wreckage of a crashed plane is that of Argentine soccer player Emiliano Sala, officials said. The 28-year-old star and pilot David Ibbotsen had been traveling in a small aircraft when it fell off radar over the English Channel on Jan. 21 as it flew from the French city of Nantes to Cardiff, Wales. The body was recovered late Wednesday after wreckage was found Sunday morning, BBC News reports. Dorset Police identified the body Thursday night. "The body brought to Portland Port today, Thursday 7 February 2019, has been formally identified by HM Coroner for Dorset as that of professional footballer Emiliano Sala," police confirmed in a statement. "The families of Mr. Sala and the pilot David Ibbotson have been updated with this news and will continue to be supported by specially-trained family liaison officers." Cardiff City issued a statement shortly after identification was confirmed, saying: "We offer our most heartfelt sympathies and condolences to the family of Emiliano. He and David will forever remain in our thoughts." A chilling audio message surfaced in the days after his plane vanished, in which Sala tries to sound calm but tells friends from aboard the doomed aircraft that he is "so scared" as it appears to be "falling apart." Wreckage from the plane was located Sunday after Sala's family raised funds for a private search by American-born shipwreck-hunting specialist David Mearns that was conducted in conjunction with British air accident investigators. TAP HERE TO READ THE FULL STORY ON CBSNEWS.COM.